Horticulturalists from two National Trust gardens have been awarded top prizes in the Horticulture Week Custodian Awards 2017. Croome, Worcestershire, was a double-award winner, taking home the ‘Best Parks Restoration/Development Project’ for the restoration of the 18th-century parkland, as well as the ‘Best Visitor-Engagement Event’ award for ‘Brown at Work’. Bodnant Garden, Conwy, scooped the ‘Best Gardens Restoration/Development’ for the restoration of The Bath area of the Victorian garden. The conservation charity looks after 173 registered parks and gardens across England, Wales and Northern Ireland, including 38 listed as Grade I. Work to restore the parkland at Croome, ‘Capability’ Brown’s first large-scale commission, started when the National Trust acquired the park in 1996, following years of neglect and intensive arable farming. Thanks to external funding of over £8 million from the Heritage Lottery Fund, Natural England, English Heritage and others, and nearly 20 years of hard work by a team of gardeners, rangers and volunteers, the parkland has been returned to its 18th-century heyday. A £230,000 donation from Monument 85 and Croome Court Appeal Committee enabled the reinstatement of the lost Chinese Bridge over the river. Thousands of trees have been returned to their original positions, follies and temples have been repaired and the river and lake have been dredged. ‘Brown at Work’, an Arts Council England funded project supported by the Landscape Institute and CB300 celebrations, was a miniature landscape created at Croome in summer 2016. Tonnes of sand and simple tools enabled visitors to form their own landscape masterpieces that could be sculpted and re-sculpted by visitors to help them understand the ‘created’ landscape in which they walked. 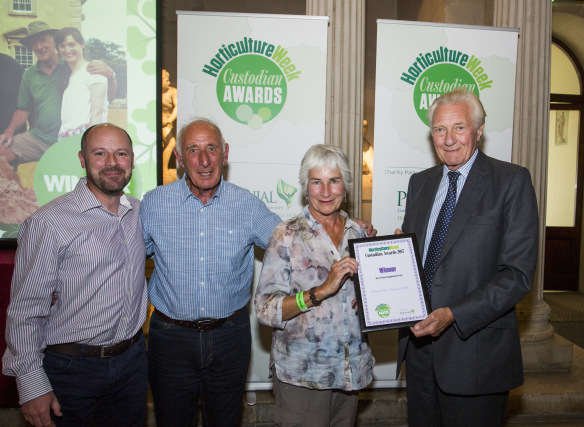 Michael Forster-Smith, Croome’s General Manager, said: “It is fantastic that the hard work of our gardens team has been recognised by this prestigious national award. With the support of a number of generous donations and grants, one of Brown’s finest works has been returned to its former glory. 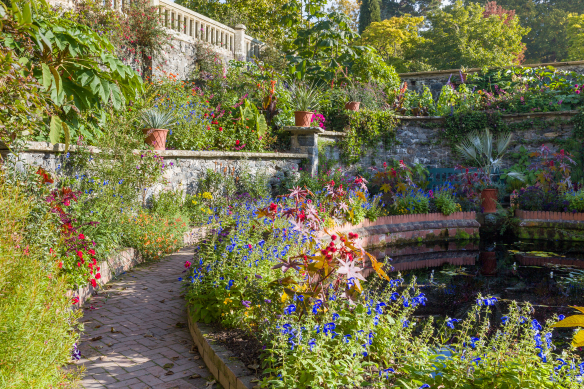 The National Trust’s third award of the night came courtesy of Bodnant Garden, Conwy. Winning the ‘Best Gardens Restoration/Development Project’ award for the two year restoration of The Bath, a Victorian ornamental pool below the front lawn of the mansion, Bodnant’s garden team was rewarded for returning The Bath to a miniature exotic paradise, as it would have been in the late 19th-century. Plans to restore The Bath were given new impetus following the winter storms of 2013/14. When an old oak tree came down, damaging walls and ripping up flower beds in the process, horticulture students working and studying at Bodnant Garden were able to develop a new planting scheme in the nearby beds. In 2016, the walls around The Bath were repaired, plants removed and a new tropical plant scheme was introduced to take advantage of the sheltered microclimate area provides. Bill Warrell, Bodnant garden supervisor, said: “To go from the devastation of the 2013 storms to this award is fantastic. It’s a credit and a real boost to the gardeners, students and volunteers who put in a huge amount of work, both repairing and renovating this lovely old part of the formal garden. Four other National Trust gardens and parks were nominated for awards, including Hardwick Hall, Derbyshire; Quarry Bank, Cheshire; Emmetts Garden, Kent and Chartwell, Kent. The winners were announced at a prestigious ceremony at Woburn Abbey House and Gardens Sculpture Gallery. Now in its second year, the Custodian Awards nominees were this year drawn from a list almost twice as long as the inaugural list in 2016. The awards were judged by an independent panel including Professional Gardeners’ Guild (PGG) chair Tony Arnold, Horticulture Week technical editor Sally Drury, former City of London Corporation director of open spaces Sue Ireland, London Tree Officers Association executive member Dave Lofthouse and master gardener Alan Sargent.